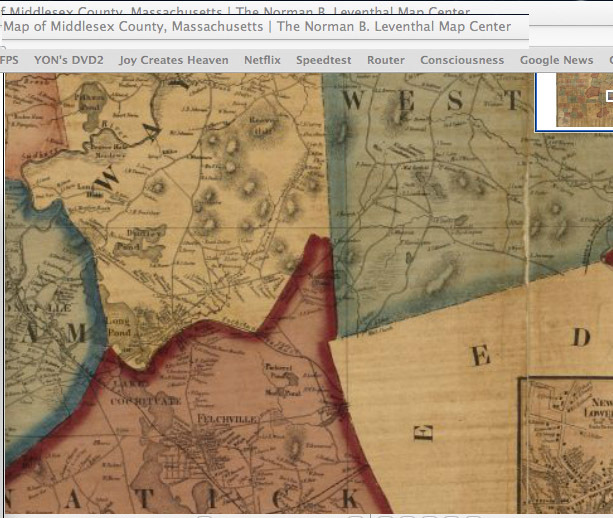 Originally on Sudbury border, with no entities between Sudbury and Dedham. Needham, Natick and Weston all being incorporated and given borders afterward 1687. 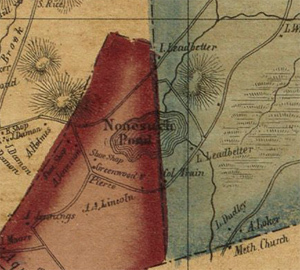 Nonesuch pond is now on the border of Weston and Natick and quite close to Wayland & Needham. 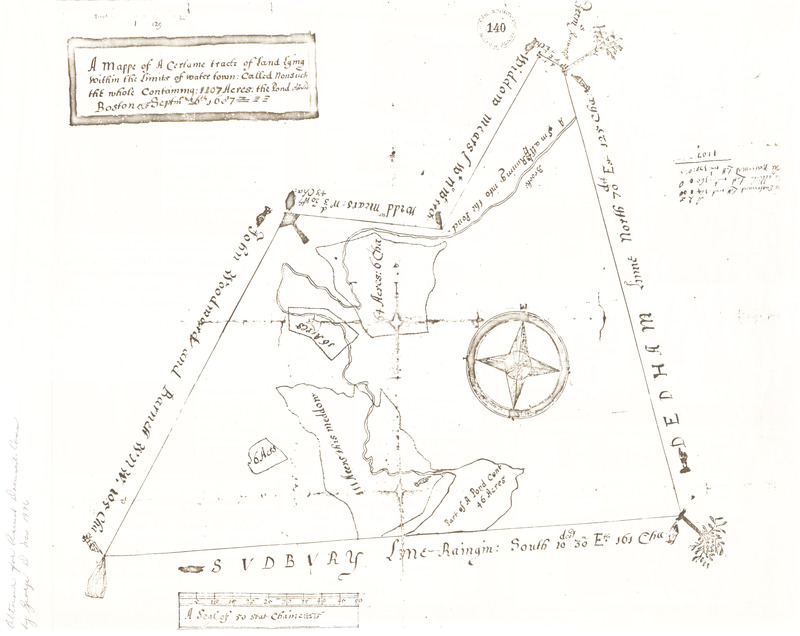 This map is used to describe the process of cutting pieces out of Watertown, until it is one of the smallest towns in the county. Let us look a little more closely into this process division and follow the geographical changes boundaries as they were made. 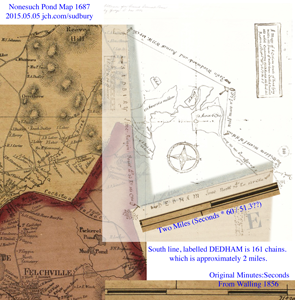 As to the manner of dividing the lands among freemen of the town we will speak later The of the town were hardly fixed before they began settle the outermost portions in systematic On October 14 1638 it was Ordered that farmes granted shall begin at the nearest meddow Dedham line beyond the line runneth at the end ye great dividend parallel to the line at the end of Towne bounds and so to go on successively from Bounds etc The earliest map preserved the archives of the State is a map of a portion of extreme southwest corner of the town next to Dedham line giving the location of lines running and north near Nonesuch Pond which lies in Sudbury. Wayland day The boundary on the east between Cambridge and Watertown has been changed several times always at the expense of territory for Watertown At first as reported to the General Court in 1035 it was near what is now Sparks Street and Vassal Lane thence across Fresh Pond to a certain poplar tree on the northwest side thence by a straight line northwest by west eight miles into the country till it meet the west line between Sudbury and Watertown or rather would have met it at an angle beyond and above Walden Pond had not that portion been cut offby the grant to Concord of six miles square. Frequently during a period of many years after the apportionment of lands to the 114 townsmen in 1637 the division of the lands at the West Farms was a source of disagreement and contention at the regular and at irregularly called meetings of the town The historian of Weston will doubtless show how delightful those fields were and what objects of contention among all the townsmen who had naturally equal right to some possession among them how many prominent men were drawn away from the older settlement to gain by occupancy these farms of the remoteness from church privileges and from schools of the injustice of church rates and other taxes which were spent where they could not easily profit by them till finally March 13 1682 83 it was voted in town meeting that those who dwell on west of Stony Brook be freed from school tax and November 10 1685 it was voted that the farmers petition should be suspended as to an answer to it until it pleaseth God to settle a minister among us In 1692 a town meeting was held to decide upon a site for a new meeting house but there was so great excitement and such differences of opinion among the people that the Governor and Council were called in to decide the matter The Governor and Council were unable to please either the people on the Farms or the people in the east part of the town In 1694 at a town meeting the east bounds of the West Farms Precinct were fixed at Beaver Brook but the General Court in 1699 fixed them at Stony Brook At the May session of the General Court the petition praying for leave To set up the public worship of God amongst the inhabitants of the west end of Watertown was granted the farmers having been exempted from ministerial rates the preceding year After long and vexatious contention the act for the incorporation of Weston was passed on the 1st of January 1713 Thus there was cut off from the territory of the old town nearly half of its area. 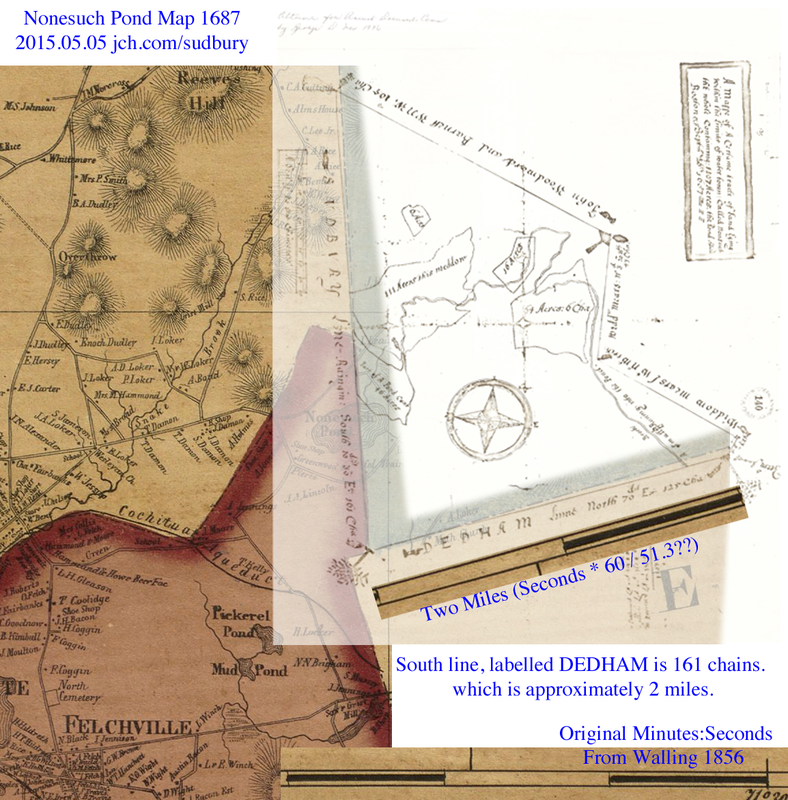 was part of Dedham in 1687. 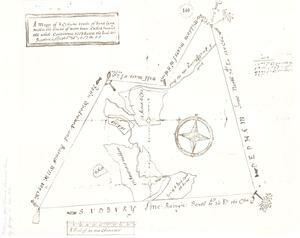 The map is of the corner of what is now Weston. border. At 42', a minute is about 1.2 miles? is 161 chains, which is approximately 2 miles. I scaled and rotated the minutes to be 2 miles.